Plant roots can alter the decomposition rate of soil organic carbon (SOC) in the rhizosphere (root-soil interface) by either stimulating or suppressing the activity of microbes and enzymes. Wang and Tang used a 13C natural abundance approach to examine the effect of nitrogen form on wheat and white lupin rhizosphere pH and associated changes in the SOC decomposition. Conceptual diagram of the effects of N form (NO3-N vs. NH4-N)-induced pH changes on the rhizosphere priming effect (the RPE) and involved N immobilization mechanisms. They found that the amount of CO2 derived from SOC in the presence of plants positively correlated with rhizosphere pH. 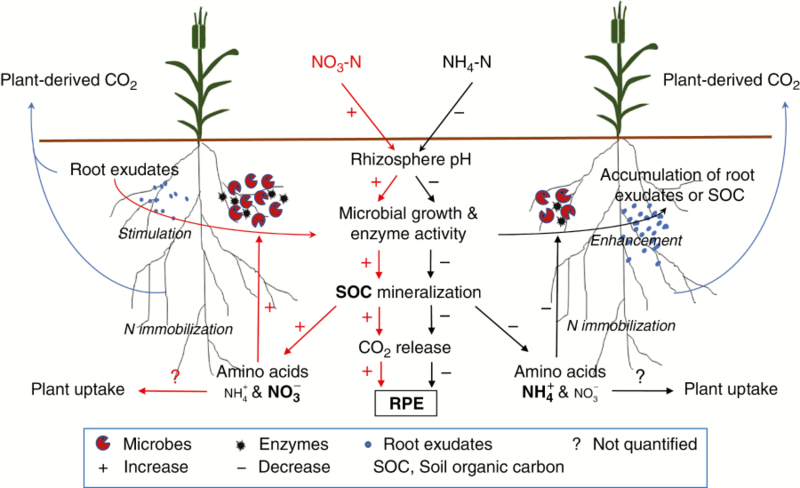 In addition, microbes in the rhizosphere of nitrate-fed plants acted as an immediate sink for nitrogen released through the enhanced SOC decomposition.